Israelis begin preparing for "the holidays" many weeks before they actually appear by promising that everything will be taken care of "after the holidays". Order something? "After the holidays" the store clerks will say. Obtain some forms from a government office? "Acharei HaChagim" the officials declare. Schedule a meeting? Finish some bank business? Open a charge account? The country literally stops for 4 weeks while everyone deals with recipes, shopping, family, and, well, the holidays. During the weeks preceding Rosh Hashana, the Jewish New Year, many school and tour groups begin to come to Tzfat in the middle of the night to walk through the lanes of the Old City, visit the old synagogues, and join in the special dawn "awakening" prayers. Residents of the Old City grumble, but they develop coping mechanisms for the groups that arrive anywhere between 12:00a.m. and 6:00a.m. The lanes become crowded with school groups and tourists, mostly secular, who come to experience the religious atmosphere of Tzfat during this month of reflection and repentance. The teachers and guides walk down the stone alleyways singing, and their charges trail behind them, meandering from synagogue to synagogue as they listen to the early-risers of Tzfat intone the traditional pre-Rosh Hashana Slichot prayers of penitence. During Rosh Hashana itself, the city's male-female balance tips decidedly in favor of the females...hundreds of men go to Uman, a city in Russia where Rabbi Nachman of Breslav is buried. R' Nachman was the last leader of the Breslev Hassidic group, and he is revered by his followers, as well as well-wishers, as a great master. Traveling to his grave is a relatively new custom...before the fall of the former Soviet Union, the site was off limits to Jews. But now, it has become a pilgrimage site for Breslaver Hassadim and friends on Rosh Hashana...tens of thousands of men (the number grows yearly) take advantage of cheap plane tickets to spend a few days praying at the site of Rabbi Nachman's grave, as well as other gravesites of rabbis in the area. Tzfat has a sizeable Breslev community, and almost all of the men save throughout the year in order to be able to travel to Uman for Rosh Hashana, which they believe will grant them and their families a good year. The Tashlich ceremony, which takes place on the afternoon of the first day of the two-day Rosh Hashana is one which brings the entire population of Tzfat out as one. "Tashlich" is the literal re-enactment of people sending their sins from the previous year to oblivion. Traditionally, Jews look for natural bodies of water in which to "cast away their sins" and in Tzfat, the body of water which can be seen at several vantage points throughout the city is the Kinneret, the Sea of Galilee. Starting at about five o'clock in the afternoon of the first day of Rosh Hashana, people begin to gather...in the Old City of Tzfat, most climb to the top of the Citadel. 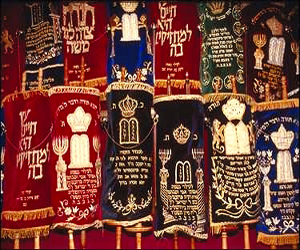 There, for about two hours, one can see men in black streimels (the fur hats of the Hassidim), black hats, colorful kippas (knitted skullcaps) and even no head-coverings at all standing together chanting while on the women's side, bewigged and kerchiefed women share their prayerbooks with neighbors and friends. Sometimes a group will begin singing, and all join in - the tunes are familiar to all, Ashkanazi and Sepharadi, Orthodox and not. The unity of the Tashlich ceremony is inarguably the strongest message of the New Year for all..